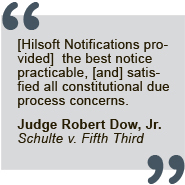 Hilsoft Notifications has placed notices in more than 53 languages and in almost every country, territory and dependency in the world. We have successfully overseen the detailed implementation of notice programs involving thousands of media placements and millions of mail pieces in both national and international markets. 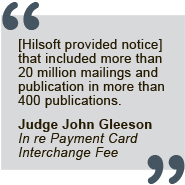 Hilsoft rapidly implements large complex cases while delivering impeccable quality. This gives great piece of mind to our clients. 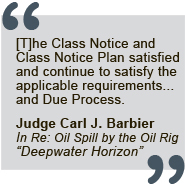 We deliver the highest quality standards of notice production, adhere to all notice program details, and research the effectiveness of our efforts to ensure that all plans are fulfilled as court-approved. We work seamlessly with various media production companies, claims administration firms, and Special Masters to ensure the best notice implementation possible for each and every case.